Before :- Vijay Kumar Verma, J. Criminal Misc. Bail Application No. 11560 Of 2009. D/d. 22.1.2010. For the Petitioner :- Lav Srivastava and V.P. Srivastava, Advocates. For the Respondent :- Rahul Kakran, V.S. Chaudhary and Devendra Singh, A.G.A. Vijay Kumar Verma, J. 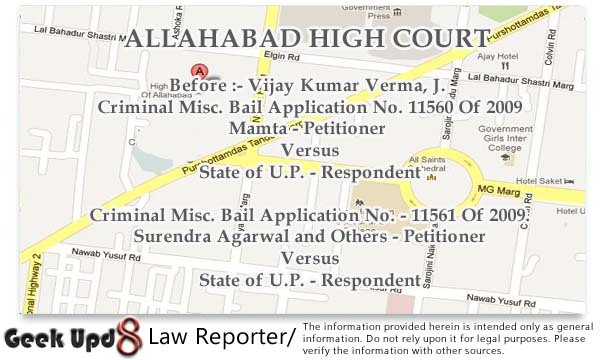 - By means of these bail applications under section 439 of the Code of Criminal Procedure (in short 'the Cr.P.C. '), prayer for bail has been made on behalf of the accused - applicants Km. Mamta, Surendra Agarwal and Smt. Manju, in case crime No. 83 of 2009, under sections 302/201/147/34 IPC, P.S. Nauchandi, District Meerut. 2. An FIR was lodged on 14.02.2009 at 5.30 p.m. by Pradeep Kumar Gupta (father of deceased Kishan), at P.S. Nauchandi, District Meerut, where a case under sections 147, 302/34 IPC was registered at crime No. 83 of 2009. The allegations made in the FIR (Annexure-1), in brief, are that on 14.02.2009 at about 10.00 a.m., Monu s/o Surendra Agarwal and Surendra Agarwal s/o Gangamal, r/o A-23 Vaishali Colony, Garh Road, Meerut along with one unknown person came at house No. 425 of the complainant, situated in Mahaveer Ji Nagar, within the limits of P.S. T.P. Nagar, Meerut and they carried his son Kishan saying that there is some urgent work with him. It is further alleged in the FIR that at about 4.00 p.m., the police of P.S. Nauchandi , Meerut by making telephone call asked the complainant to reach at house No. A-23, Vaishali Colony Meerut immediately and when the complainant reached there, he saw that the dead body of his son Kishan was lying inside the house. 3. After registration of the case at P.S. Nauchandi, Meerut, inquest proceedings of the dead body was conducted and thereafter the dead body was sent for post-mortem examination to the mortuary. The post-mortem examination of the dead body was conducted by the order of District Magistrate Meerut by the pannel of Dr. V.P. Singh, Dr. Satish Kumar and Dr. N.P. Singh on 14.02.2009 in the night in artificial light at 11.40 p.m. The cause of death could not be ascertained and hence the viscera was preserved, which was sent for chemical examination to the Forensic Science Laboratory Agra. According to the report of Forensic Science Laboratory (Annexure - C.A.-1 to the supplementary counter affidavit), Ethyl Alcohol poison was found in part-1 to 5 of the viscera, but any other kind of poison was not found in any part of the viscera. 4. I have heard arguments at length of Sri V.P. Srivastava, learned senior counsel assisted by Sri Lov Srivastava appearing on behalf of the applicants, AGA Sri J. P. Singh for the State and Sri Devendra Singh Advocate, appearing for the complainant and perused the entire material on record carefully. 5. The first and foremost submission made by learned counsel for the applicants was that the deceased had died due to alcoholic poison, for which the applicants cannot be held liable, because there is no evidence in the entire case diary to show that the deceased Kishan was forced to consume alcohol by the applicants. The contention of Sri V.P. Srivastava, learned senior counsel, was that Ethyl alcohol is found in all kind of Alcoholic beverages like Whisky, Rum, Gin, Strong Liquors, Brandy etc. and absolute alcohol of different percentage is found in all these drinks and poison is invariably found in the Ethyl alcohol and if excessively large dose of alcohol is taken at a time or small doses at short intervals are taken, then acute poisoning may result from the consumption of an alcoholic beverage, which caused death in some cases and since the death of deceased also was caused due to alcoholic poison, hence the applicants deserve bail, because no witness has stated that the deceased was compelled by the accused persons to consume alcohol. In support of the aforesaid contentions, the learned counsel for the applicants has drawn my attention towards Chapter 9. "Inebriant Cerebral Poisons" of Modi Medical Jurisprudence. My attention was also drawn towards Chapter 5 "Poisons Acting on Central Nervous System" of COX Medical Jurisprudence and it was contended by the learned counsel that although Methyl Alcohol is not fit for human consumption and is found as impurity in a number of cheap alcoholic drinks, but ethyl alcohol is consumed by human being in the form of various drinks (alcoholic drinks). The submission made by learned counsel for the applicants was that poison in certain quantity is found in all alcoholic drinks and if excessive dose of alcoholic drinks is taken, then death may occur due to acute poisoning. 6. About the complicity of the applicants Surendra Agrawal and Smt. Manju (parents of the applicant Km. Mamta) in the incident of alleged murder of deceased Kishan, it was further submitted by learned counsel for the applicants that theory of carrying the deceased from his house by the accused Surendra Agarwal and his son Monu on 14.02.2009 at about 10.00 a.m. is falsified by the call details of mobile No. 9259052649 belonging to the applicant Mamta and Mobile No. 9219700070 which belonged to the deceased Kishan. For this submission, my attention was drawn towards the call details (Annexure C.A.-1 to the 2nd supplementary counter affidavit filed on 19.01.2010), according to which the deceased Kishan and the accused-applicant Km. Mamta, who were having love affairs, had talked to each other even after 10.00 a.m. on aforesaid mobile numbers on 14.02.2009. The contention of the learned counsel for the applicants was that if the deceased Kishan would have been carried at about 10.00 a.m. on 14.02.2009 by the applicant Surendra Agarwal and his son Monu Agarwal as alleged in the FIR and had he been in their custody after 10.00 a.m. on 14.02.2009, then the question of making calls on the aforesaid mobile numbers by the deceased and accused Km. Mamta on 14.02.2009 after 10.00 a.m. does not arise, whereas they had talked to each other on aforesaid mobile numbers at 10.45 a.m., 11.06 a.m. and 11.07 a.m. on that date, which indicates that the deceased was not in the custody of the accused Surendra Agarwal and his wife Smt. Manju Agarwal on 14.02.2009 after 10.00 a.m. and hence on this ground also, these applicants deserve bail. 7. It was also submitted by learned counsel for the applicants that at the most the offence punishable under section 201 IPC can be made out against the applicant Surendra Agarwal, who is said to have kept the motorcycle of the deceased at some other place after removing the same from outside his house with a view to destroy the evidence of showing presence of the deceased in his house. The said motorcycle is said to have been recovered by the police on the pointing out of applicant Surendra Agarwal. It was also submitted in this very context that due to washing the floor of the house also, the offence punishable under section 201 IPC can only be made out. 8. About the bail application of Km. Mamta, it was submitted by learned counsel for the applicants that on the basis of the statement made by Km. Mamta during investigation, this fact is borne out that she was in love with the deceased Kishan for a long time and she wanted to marry him and he was called by her on 14.02.2009 to her house at the time when her parents had gone to market and on being called by Km. Mamta, the deceased had come to her house at about 11.15 a.m. and if the deceased died in the house due to acute poisoning by consuming excessive dose of ethyl alcohol in some alcoholic beverage, then the applicant Km. Mamta can not be held liable for the death of deceased, as there is no evidence to show that the deceased was compelled by Km. Mamta to take excessive dose of alcohol beverage after reaching her house. It was also submitted by learned counsel that the alleged confession made by Km. Mamta in her statement before the investigating officer is not admissible in evidence being hit by Section 25 of Evidence Act and hence the alleged confession of Km. Mamta cannot be used against her. It was also submitted in this very context that theory of giving sulphas powder to the deceased for consuming by the applicant Km. Mamta on the pretext of surprise on Valentine Day is falsified from the report of Forensic Science Laboratory Agra, as except ethyl alcohol poison, no other kind of poison was found in any part of the viscera, which shows that the deceased did not consume sulphas powder as has been shown in the alleged confession of Km. Mamta, which is said to have been made to the investigating officer during interrogation. For this submission, my attention was drawn towards the copy of the statement of Km. Mamta, which has been filed as annexure-5 in both the bail applications. It was also submitted by learned counsel for the applicants in this context that there was Valentine Day on 14.02.2009 and the deceased is said to have been called by Km. Mamta to her house in the absence of her parents and if with a view to celebrate Valentine Day , the deceased had consumed excessive dose of alcohol beverage and he died as a result of acute poisoning, then Km. Mamta cannot be held liable for his death, because there is no evidence to show that excessive dose of alcohol beverage was given to the deceased by the applicant Km. Mamta. 9. Both the bail application were vehemently opposed by learned counsel for the complainant and learned AGA contending that in the well planned manner, murder of deceased was committed by giving poison to him in some alcoholic drink and since the dead body of deceased was found in the house of applicants, hence in this heinous crime of committing murder and destroying the evidence, applicants should not be released on bail, because the dead body of deceased Kishan was found lying in the house of applicants, and hence they shall be held liable for causing his death. 10. I have given my thoughtful consideration to the aforesaid submissions made by the learned counsel for parties. From the statement of the applicant Km. Mamta, which was recorded during investigation by the investigating officer, on which reliance has been placed by the prosecution, this fact is borne out that the deceased and Km. Mamta were in love with each other for a long time. From that statement, this fact is also borne out that with a view to celebrate the Valentine Day on 14.02.2009, Km. Mamta had called the deceased to her house at the time when her parents (applicants Surendra Agrawal and Smt. Manju) had gone out of the house. From the statement of Km. Mamta, this fact is also borne out that when the deceased told Km. Mamta that the talks of his marriage are going on from Bulandshahr, Km. Mamta became annoyed and she broken both the mobiles of deceased, which were found lying in her house at the time, when the police reached there on getting information. The report of Forensic Science Laboratory Agra (Annexure C.A.-1 to the 2nd supplementary counter affidavit), shows that Ethyl alcohol poison only was found in parts 1 to 5 of the viscera of deceased and no other kind of poison was found in any part of the viscera. The post-mortem report of the deceased shows that the cause of death could not be ascertained at the time of post mortem examination. There is nothing in the entire case diary to show that the deceased was compelled by the applicants to consume excessive dose of any alcohol beverage, in which ethyl alcohol containing poison is found. On the basis of the opinion given in Modi Medical Jurisprudence in Chapter 9 under the heading 'Acute poisoning', death can occur due to acute poisoning by consuming alcohol beverage in small doses at short intervals or in an excessively large dose at the same time. The deceased is said to have been carried from his house on 14.02.2009 at about 10.00 a.m. by the accused Surendra Agrawal and his son Monu Agarwal, as alleged in the FIR, but from the call details filed by the State of U.P. on 19.01.2010 with 2nd supplementary counter affidavit, this fact is borne out that even after 10.00 a.m. on 14.02.2009, the deceased Kishan and Km. Mamta had talked to each other on mobile No. 9259052649 belonging to Km. Mamta and mobile No. 9219700070 which belonged to the deceased Kishan. Therefore, keeping all these facts in view, but without expressing any opinion about merit of the case,all the three applicants may be released on bail. 11. Let the applicants Km. Mamta, d/o Surendra Agarwal, Smt. Manju, w/o Surendra Agarwal, and Surendra Agarwal, s/o Ganga Mal be released on bail in Case Crime No. 83 of 2009, under sections 302/201/147/34 IPC, P.S. Nauchandi, District Meerut on their executing a personal bond for Rs. 50,000/- and furnishing two sureties each in the like amount to the satisfaction of the trial court concerned.